I am trying to test code that merges two XML files. In the unit test that I am attempting to implement, I want to compare the difference between the merge result and one of the XML files (the larger of the two). The right-hand XML file has 13 elements underneath the root, while the left-hand file has 4. Two elements in both files are equivalent, so the left-hand version is discarded. What I’m expecting is that the two remaining elements in the left hand file are merged into the resultant XML, so that in reference to the right-hand file, the merged content has two additional elements underneath the root. I’ve used XMLUnit previously to compare generated XML with expected output. In this case however, I am more concerned with evaluating the differences between the source and resultant XML. XMLUnit has a Diff object – org.custommonkey.xmlunit.Diff – which I realised, after some investigation, doesn’t quite offer a diff in the traditional UNIX diff/patch command sense. It evaluates a document in terms of being identical, similar or different, and holds a message describing the first difference encountered. ..and the concept of a patch – that the set of +/- lines differences are collected and made available for inspection/verification. 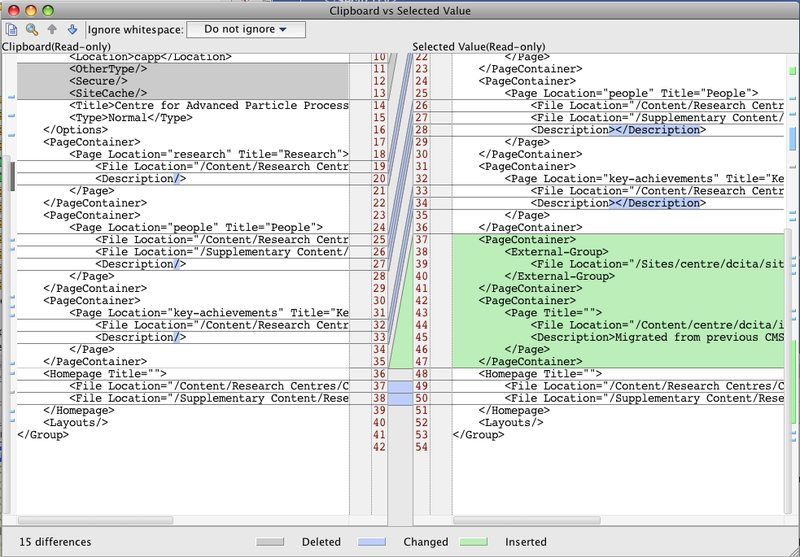 DetailedDiff is an extension of Diff, which will give me a list of all the Differences in the comparison. ..will assert that the comparison has resulted in a mismatch in the number of children between the two XMLs (Javadoc). A few of those assertions could describe the expected differences between the XMLs. So while XMLUnit gives us a pretty good toolset for XML comparisons, I’m still wondering if there’s a more diff-oriented tool I could use. I found java-diff-utils, which looks like it could be a good option for handling diffs the way I’m imagining. Lets have a go! // Compute diff. Get the Patch object. Patch is the container for computed deltas. ..where original and revised are List objects. The Patch object gives us a list of Deltas, containing the ‘original’ and ‘revised’ segments. Perfect! The Delta itself contains a list of text lines, so we could potentially verify the list of strings manually. This needs a couple of helper functions to load the diff file into a String, and convert the delta List into a String also. This entry was posted in Code and tagged code quality, diff, java, unit testing, XML, XMLUnit. Bookmark the permalink.